On cool and rainy, lazy, really don't-want-to-get-out-of-bed mornings I usually go for colorful, easy and tasty breakfasts. Today's choice was a breakfast parfait with Greek yogurt, fresh strawberries, blueberries and nutty granola. 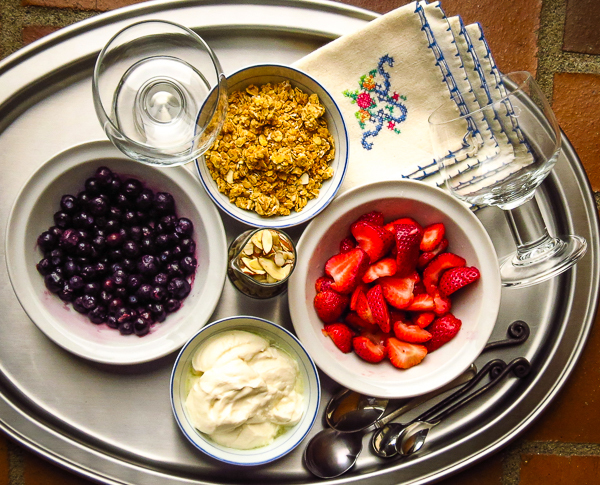 The fruit provided color, fresh berries and honey-flavored yogurt added sweet flavor, and the granola and almonds brought some crunch. Fresh ingredients and the total lack of cooking handled the easy requirement. 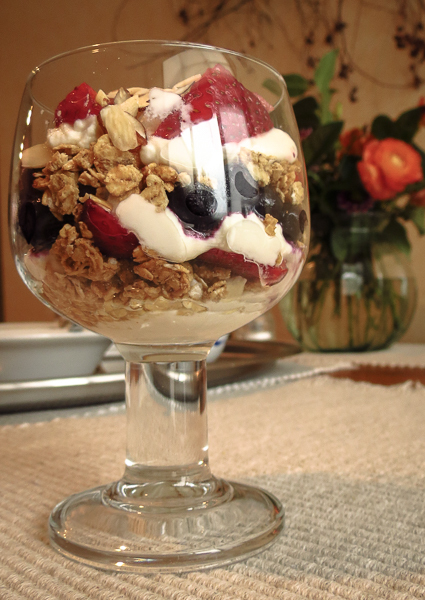 This layered parfait looked temptingly fancy in a glass goblet and kept me satisfied for hours. RL went for seconds; always a good sign. 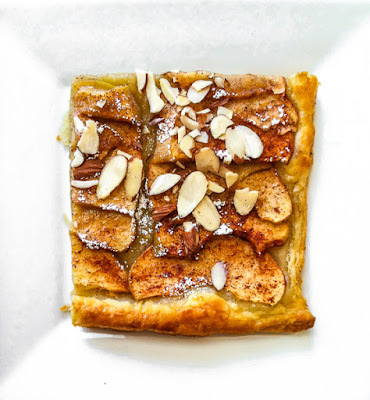 Yesterday's puff pastry tart with carmelized apples was delicious, but took too much time and effort to repeat this morning. Today's parfait was just as satisfying and undoubtedly healthier. What do you choose for breakfast when you are in a hurry? It seems that everyone has an opinion regarding the best way to roast a chicken - whether grandma's method, a favorite chef or restaurant's technique, brined or not, trussed or spatchcocked flat, beercan or trivet held... The variations are endless. 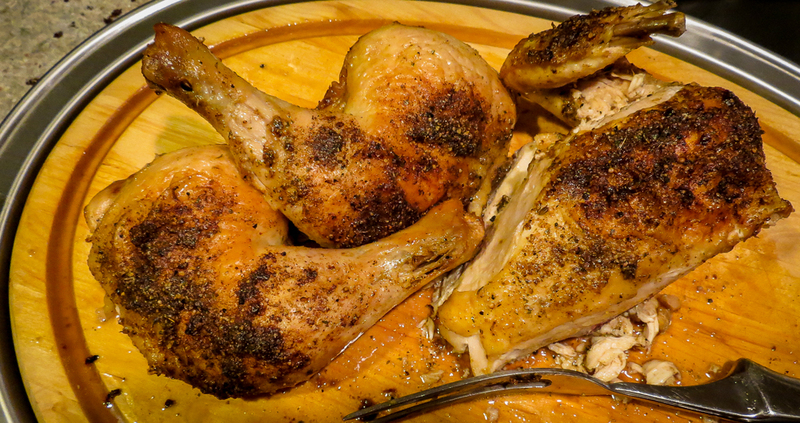 I've tried many different methods with varying degrees of success, but my current favorite is Jacques Pepin's "Broiled and Split Roasted Chicken." This preparation takes a little over an hour and yields great flavor, rich color and beautifully crunchy skin with an accompanying pan sauce that is scrumptious. I may never roast a chicken any other way. Of course I'll experiment a bit with the spice mix, you know I can't resist, but it's the broil-and-roast method that is the new winner. Don't be put off by the seemingly long list of ingredients and directions. This recipe is simple to prepare and the results more than make up for any fiddly work removing the backbone with kitchen shears. Do make the pan sauce, it adds a welcome spicy flavor pop to each bite of chicken. Give this recipe a try and you too might think it's the best chicken ever! Butterfly the chicken (remove backbone, chop off tips of wings, crack/flatten the breastbone). Place the spices and salt in a grinder and process into a coarse powder. Set the spice mix aside. Brush both sides of the chicken with melted butter; place skin side down in a large, shallow-rimmed roasting pan. Place the pan on an oven rack adjusted so the chicken is about 6 inches from the heat. Broil for 10 minutes or until the flesh is lightly browned. Remove from the oven and set the oven temperature to 400 F.
Sprinkle about 1/4 of the spice mix over the broiled underside of the chicken. Flip it over, breast side up, and arrange it to lay flat in the pan. Sprinkle the remaining spice mix evenly over the skin. Place the pan in the center of the oven and roast for 1 hour or until done, basting several times with the pan juices. Check for doneness with a meat thermometer (165 f) or by piercing the thigh (looking for the juices to run clear yellow with no trace of pink). The skin should be crispy and colored deep mahogany. Transfer the chicken to a platter and let rest in a warm oven for 10 minutes while you make the sauce. Spoon off all but a tablespoon or two of fat. Place the roasting pan over two burners set to medium heat; add the shallots and cook until they sizzle. Pour in the wine and stock and heat rapidly to simmering, scraping up all of the glazed brown bits in the bottom of the pan. Taste and adjust seasoning. Add more wine or stock and/or boil it down to thicken a bit. Whisk in the butter just before serving for a richer finish. To carve, slice the chicken straight down the middle to the breast bone; slice 2 thick 3/4-inch vertical slabs of breast meat from the inside of each breast half. Serve the two outside pieces of breast with wing attached. Separate legs from breast; cut drumsticks away from thighs, then cut thighs in two. Arrange the 12 pieces on a serving platter and drizzle some pan sauce over all. Serve, offering more sauce on the side. ...recommended for breakfast, as appetizers, or as anytime treats! 1) Sweet cream puffs (choux) are sometimes unreliable, often failing to puff, instead producing flat wafers. 2) Savory cheese puffs (gougeres) perform more consistently, but an occasional batch will still go rogue. 3) Sweet and savory puffs only fail when success is really, really important, like a company event. Always have a biscuit backup plan, just in case. 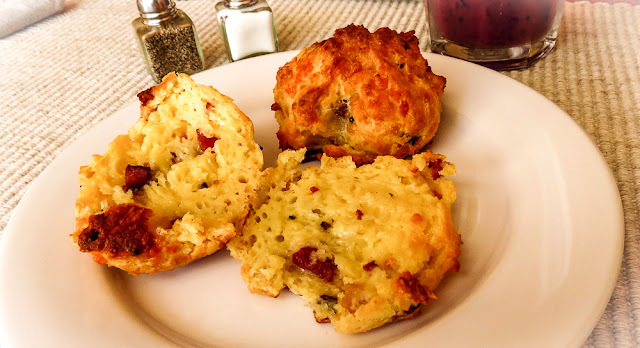 That said, this week's gougeres, a potential disaster-in-the-making, ultimately rose to the challenge and saved the day and my reputation as a cook. A guest texted a message announcing major traffic problems and her late arrival for lunch. No problem, I delayed mixing a small batch of cheese puffs until the last minute. Fiddling around in the kitchen, I created a new salad dressing, set the table, eventually grew totally distracted and it all went downhill from there. In a rush to get the puffs mixed as she arrived, I somehow doubled the liquids but didn't notice the mistake until after adding the butter and flour. No matter how much I beat in the flour, the dough refused to come together into a ball. Oops! Reread the recipe, check out the measuring cup, roll eyes and smack self on the head. Instead of starting over I pressed on and hoped for the best. At worst there would be one more interesting kitchen story. Sigh! Melt more butter and beat in over low heat. Beat in 4 eggs, one at a time, and don't complain when arm grows tired because the dough is heavy. Beat in more flour and keep beating until the dough forms a ball. (Remember to smile.) Sing Hallelujah! when it finally comes together. 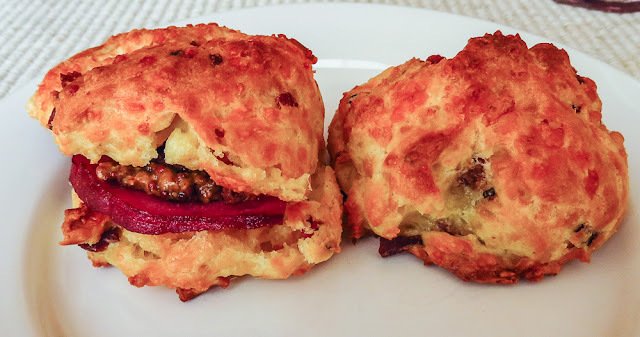 Add the cheese, bacon bits and pepper; scoop 16 balls onto two silpat-lined baking sheets and send a prayer skyward to the kitchen gods while the puffs bake. Whew! luck prevailed. The texture was spot on; a crunchy exterior covered light, tender insides and most puffs displayed hollow centers. These were the best gougeres ever. Go figure! Doubling the recipe worked, even with such an unorthodox method. 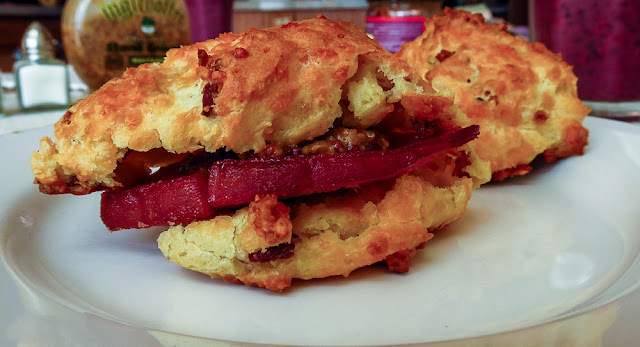 Slone left with a package of puffs for her drive south and we enjoyed the remaining treats as breakfast sandwiches over the next several days. Use a small, heavy saucepan and combine milk, water, butter and salt. Bring the mix to a boil over high heat. Reduce the heat to moderate; add the flour all at once and beat the mixture with a sturdy wooden spoon until it leaves the side of the pan and forms a ball. Stir for 2-3 minutes longer to dry out the dough a bit. Remove the dough from the heat and transfer to a bowl; beat for another minute or two until the dough cools down a bit and stops steaming. Use a heavy spatula or whisk and beat in the eggs, 1 at a time, whisking well after each addition. Stir in the cheese, bacon and pepper. Drop or scoop the batter in 8 mounds on a prepared baking sheet or silpat. Bake puffs in upper third of a preheated 400 oven for 20-25 minutes, or until crisp and a rich golden brown. The puffs may be kept overnight in an airtight container. Reheat briefly in the oven, if desired, but note the puffs will lose crispness if reheated in a microwave. One lone fennel bulb remained in the crisper, it's green-grocer partners already used in German potato salad (link), potato hash with sprouts and fennel (link), and a seafood soup (link). One fennel bulb... now what? Fennel has a pronounced anise-like flavor, one that takes center-stage in most dishes, but one small bulb wasn't much to work with. 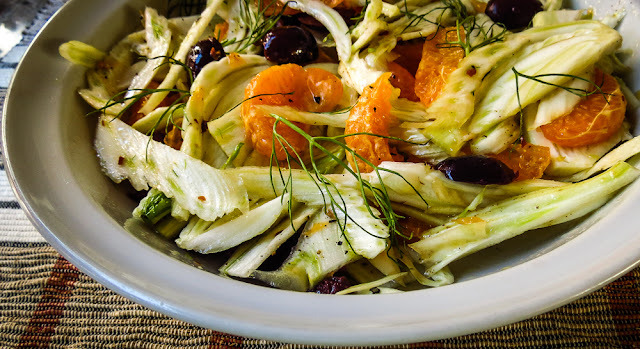 The Flavor Bible lists oranges, black olives and coriander among suggested pairings with fennel so I went with those ingredients to whip up a fast fennel salad. It was a good decision; we loved that flavor combination and the crunch. Salty olives, licoricey fennel and the sweet-tart tang of citrus play well together. Halve, core, and thinly slice bulb (preferably on a mandoline). In a bowl, toss fennel with 2 tablespoons fresh lemon juice. Slice away peel and pith of oranges and cut flesh into segments. Add to bowl with fennel and stir in small olives such as Nicoise, reserved fennel fronds, and extra-virgin olive oil. Season with coriander, coarse salt, freshly ground pepper, and (optional) red-pepper flakes. Note: this pairs well with fish, as a side dish or as the flavorings in a fish-in-parchment entree.